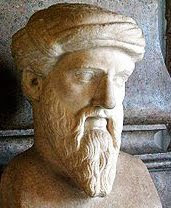 Pythagoras of Samos (570 B.C. to 495 B.C.) was a mathematician and scientist best known for providing Greeks with the Pythagorean theorem in geometry and algebra. But he was also a philosopher (the first to call himself one) who eventually established a university (some call it a religious sect) on the island of Croton, a Greek colony in southern Italy. There are ample mysteries surrounding Pythagoras, including that he was not a mortal man but rather a god who had taken human form to instruct the human race. Others say he was a demigod, a son of Hermes or Apollo. It is easy to understand why, given his extensive studies and contributions to geometry, music, and astronomy. At the core of these contributions, Pythagoras linked them all to mathematics and the secret significance of numbers. Even after 2,500 years, philosophers from all over the world have been unable to unlock the remnants of his lexicon, mostly because much of which he taught was never written down. His disciples committed it to memory in order to keep their secrets. Although Kevin Guilfoile only scratches the surface of Pythagoras, it does serve as the foundation for his thriller, setting heroine Canada Gold (Nada) at the center of a civil war between two factions of a secret society, modern day remnants of the Pythagoreans. One faction wants to expand the teachings. The other wants to preserve its purity and all of its secrets. At points it almost seems a shame that Guilfoile offers no real astute details about the fictionalized factions and their secrets, but the book is still entertaining in the partial pursuit of a reconstructed ending for Wolfgang Amadeus Mozart's famed Requiem. The new completion, apparently using Pythagoras's teachings, was completed at the hands of composer-conductor Solomon Gold, Canada's father. He is murdered early in the book, apparently as an act of revenge, shortly after being acquitted of the murder of a violinist in his orchestra, with whom he was having an affair. With the loss of Gold, so is his masterwork, the completion of the Requiem. However, the pursuit of the Requiem is only a partial quest. The other pursuit is of Canada herself, ten years after the death of Gold. She seems to target of the competing factions because of her relentless interest in her father's case and for a neurotransmitter implanted in her head to curb seizures. The device does more than cure seizures; it provides her with a de facto mental acuity, photographic memory, and potential to unlock Pythagoras's secrets. For the most part, Guilfoile does a fine job building a story with an interwoven conspiracy and the extent people will go to profit from or protect such secrets. However, the primary driver of this novel better parallels an adventure crime thriller than the greater effort of more popular legend-based thrillers. The writing struggles frequently, with rough transitions and chapter openings that leave readers guessing whose point of view they have adopted. It's a curious issue, sometimes creating the daunting task of rereading every chapter opening with a different perspective once you know which character's eyes the author has loaned. Another annoyance is the constant swapping back and forth of characters' first names and last names for no reason whatsoever, even on the same page. Guilfoile is an American novelist, essayist and humorist. His first book tapped his humorist skills by creating a scrapbook parody about President George W. Bush. Four years later, Guilfoile shifted toward more serious subjects with Cast of Shadows, a thriller that takes place after cloning has been legalized in the United States. Guilfoile is a fine writer, but still seems to lack the literary prowess and discipline to translate imaginative stories into masterful works. Still, The Thousand is entertaining and memorable, with elements that raise interesting questions for exploration. The Thousand By Kevin Guilfoile Measures A 2.9 On The Liquid Hip Richter Scale. It's easy to understand why some readers become frustrated with The Thousand. It's a good story, but makes it all too obvious that it wants to be much more than the final work delivers. The coolness comes from the reintroduction of the Pythagoras mythos and treatment of some supporting characters as adventure heroes, especially Canada's courtier Wayne Jennings, who is the only character in the book to escape a queer self-fascination and self-interest with himself (or herself). 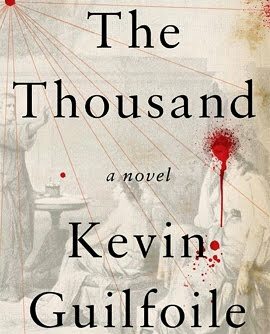 The Thousand by Kevin Guilfoile is available on Amazon. It's a decent, although thinner, placeholder between the next novels by authors like Michael Crichton and Dan Brown.